Ever try to shred a pack of documents only to have the metal staple jam up your shredder? Yeah, staples are so 1998. If, like me, you find that staples do little more than get in your way, then why not switch to a stapler that does not use metal staples for your document binding needs? That’s right, a staple-free stapler! This nifty tool that I speak of is none other than Greenhome.com’s Original Staple-Free Stapler. Fun Colors – Comes in a variety of colors. No Jammin’ – The ‘staple’ is made of paper, so it can be shredded without fear of jamming. 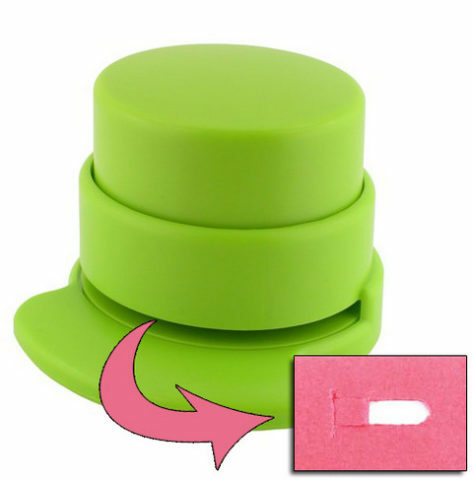 Eco-friendly – Eliminates the need for staples, staple remover, and other stapling paraphernalia. Paper limit – Since the stapler uses a cut sheet of paper as the staple (or ‘stitch’), it can only staple 5 pieces of paper at a time. Most staplers can staple around 15 papers at one time. Price – This stapler sells at a price that’s nearly double the average stapler that you can easily find from $2 to $5. This stapler earns mega cool points, but do you really need it? Not necessarily. True, the stapler might help you become a bit more eco-friendly by reducing your office’s need for metal staplers and streamlining your paper recycling, but removing metal staples might not be that big of a pain (or cost) for you and your office. I’m going to file the Staple-Free Stapler under “great boutique” items in my book. It performs its function well and is definitely greener than your average stapler. However, if you don’t have extra money lying around to spend on a stapler, then I encourage you to take the extra time to “un-staple” your paper and then recycle it. Being a boutique item, it would be perfect gifts for those office parties throughout the year. Let us not also forget the good ole “dog-ear” for small document binding needs as well. Has anyone bought or received the Staple-Free Stapler as a gift? If so, what was your experience with it?